This card is entered into the Crazy Crafters Project Highlights this week. Click here to see the other great projects and vote for your favourites. I love colouring with alcohol markers, so I'm very excited about the new Stampin' Blends - which will be available from 1 November! One of the perks of being a Demonstrator is early access to products so I've been having great fun already! 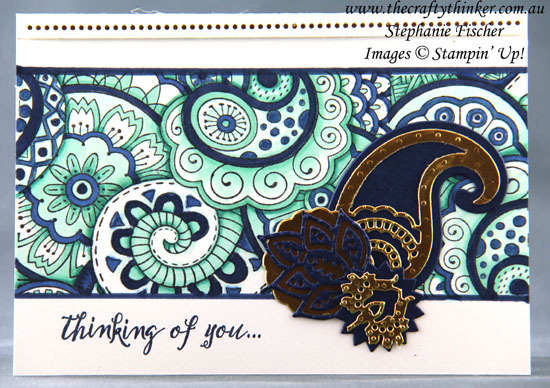 For this multipurpose card, I stamped the image (twice) from the Hello Colour stamp set with Memento ink and then coloured it with Stampin' Blends in Pool Party, Bermuda Bay and Night of Navy colours. 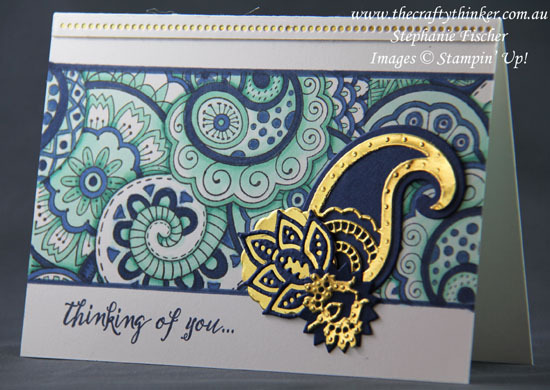 The greeting from Feather Together is stamped with Night of Navy ink and I used the Paisley Framelits to cut some Night of Navy and Gold Foil . The decorative strip at the top of the card was leftover from a previous project and is made with a die from the Swirly Snowflakes set with a little strip of Gold Foil Sheet behind it. I was originally planning to use Stampin' Write Markers rather than the alcohol markers and by changing my mind I did create a little problem for myself. Alcohol markers do bleed through the cardstock (in this case Thick Whisper White) which looks a bit of a mess on the back. Had I planned (or been thinking straight!) I would have made a layer so that the back would have been hidden. I did consider chopping this card into a layer (and maybe I'll still end up doing that) but I've mostly hidden the mess with an insert. Stampin’ Blends artist-quality alcohol markers will be available in 12 exclusive Stampin’ Up! colours. Each of the colours has a light and dark shade and there are also two skin tones and a colour lifter - giving a grand total of 27 markers. For a limited-time (while stocks last) Stampin' Up! will also be offering a Color Me Happy Project Kit and Color Me Happy Stamp Set.